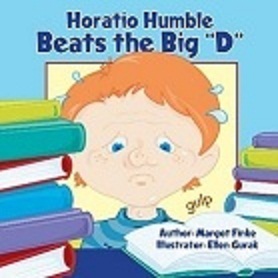 Horatio Humble Beats the Big D, by Margot Finke, illustrated by Ellen Gurak, is a humorous approach to a serious learning problem. Horatio can’t read. He wants to read, but words are all jumbled in his head. His teacher diagnoses dyslexia and suggests a special education class, which Horatio dreads. Finally, he is helped and learns to read all the books he’s always wanted to read. This is a happy ending achieved through insight and hard work. Using rhyme to convey Horatio’s learning disability and his ultimate triumph is just perfect. My hat goes off to authors who rhyme. Children love rhyming books--they’re fun for parents and teachers to read and even more fun for children to hear. Margot Finke both entertains and enlightens. This book helps children understand problems they and their classmates may have and offers hope of overcoming such difficulties. The expressive illustrations by Ellen Gurak ensure readers understand Horatio’s feelings and fears. On each page Horatio’s face clearly shows what’s going on as he moves from despair to success. Even non-readers will "get it" just by “reading” these engaging pictures. In the past dyslexia has caused enormous pain and lost opportunity for many. It’s important that we are getting better at identifying and treating it. This will open the wonderful world of reading and success in school for children who have this disability. I thank Margot Finke for broaching the subject in a most gratifying and appealing way. This is a good book, and will be helpful to lots of kids. I had the pleasure of reading and reviewing this wonderful book last year. I love Margot's unique ability to write in rhymes. A delightful book with a great message. Penelope, thank you so much for taking the time to review "Horatio Humble." I do appreciate your time and words of support. The included parent/teacher guide is helpful to both child and adult. One of my daughters had mild dyslexia, so this prompted me to work at helping other children overcome it, and learn to read with enjoyment. There is a link to a video of me reading from Horatio, and chatting about dyslexia, on my website. Janet and Nicole, your support is always so wonderful. Thanks a million! !